Way back in 2012, when Destiny was still in the midst of development, Paul McCartney tweeted something unexpected: He was working on music with Bungie, the studio making the game. 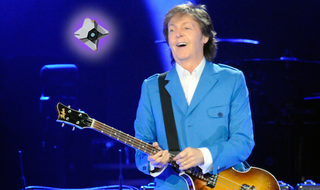 It recently became clearer what McCartney's involvement entailed: According to the New York Times, McCartney collaborated with Bungie composers Marty O'Donnell and Mike Salvatori on the game's score, and also wrote and recorded a theme song. The song's called "Hope for the Future," or at least, I'm assuming that's what it's called. As I round the 20-hour mark in Destiny, I can confirm that shooting a thousand aliens in the face does, in fact, kinda give me hope for the future. A future free from the scourge of aliens. You'd never guess that's the theme song from a first-person shooter about moon wizards, would you? I like the post-chorus, and also the part where he says the name of the game.